VimFx is an add-on for the Firefox web browser that adds Vim-style keyboard shortcuts for browsing and navigation to the browser. First, there was Vimperator, an excellent powerful extension for Firefox that made Firefox behave more like the Vim text editor. Then came the Chrome extension Vimium which concentrated on bringing keyboard shortcuts to the Chrome browser. VimFx is modeled after the Chrome extension. 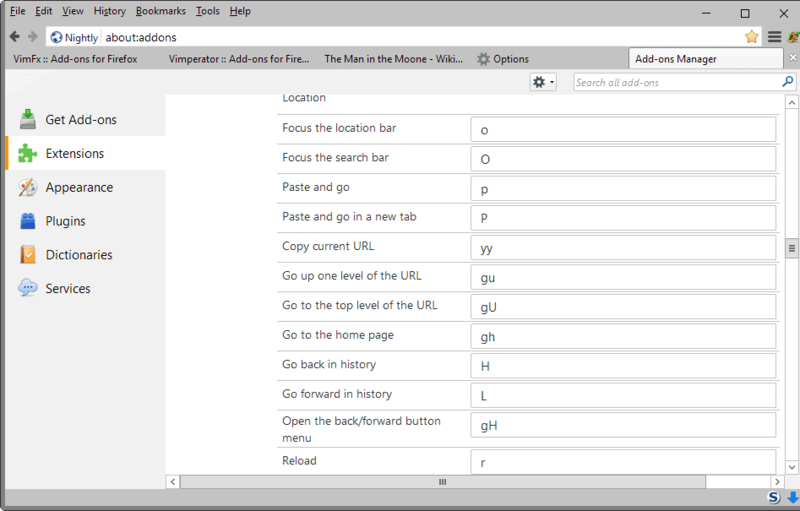 While not as powerful as Vimperator, it is a lot easier to use as a consequence as it concentrates on improving browsing and navigation by introducing new keyboard shortcuts to the Firefox web browser. 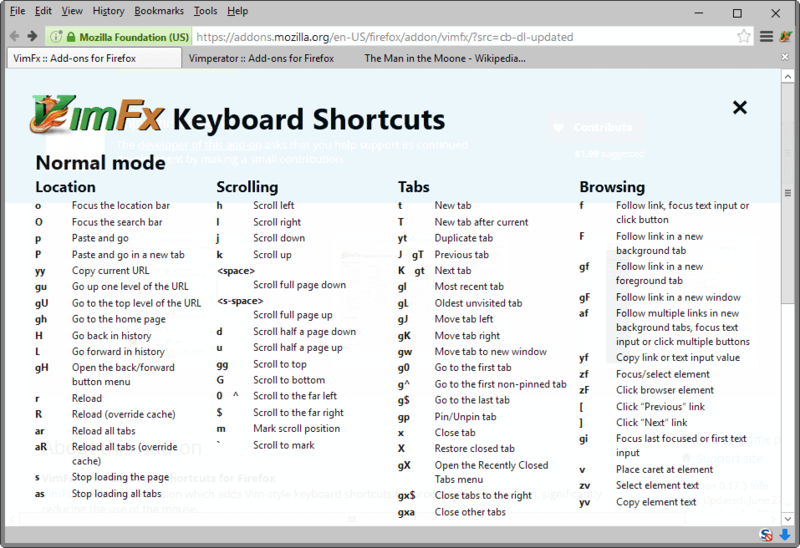 VimFx introduces a massive number of new keyboard shortcuts to Firefox, and this can certainly be intimidating at first. A good starting point is to press "?" on the keyboard to display the shortcut cheat sheet that lists them all. You will notice that you may not need them all, but that several may speed up how you use the browser. Generally speaking, shortcuts are made up of one to three characters on the keyboard that you type to execute a command. A tap on "t" opens a new tab page, "j" and "k" scroll down and up, "o" focuses the location bar, "yy" copies the URL, and "s" stops the loading of the page for instance. Some keyboard shortcuts require upper case letters which makes them a bit harder to type quickly. The shortcut "aR" for instance reloads all browser tabs, and "gx$" closes all tabs to the right of the active tab. VimFx ships with options to change the mapping of any keyboard shortcut. If you prefer only lower case shortcuts, or shortcuts without special characters, then you may modify them to your liking in the options. You may also unmap shortcuts by leaving them blank in the options. This is useful to prevent executing an associated action by accident for instance, or simply to improve the readability of the shortcuts listing in the options. VimFX reflects all changes on the cheat sheet so that it is easier to use as well once you start removing shortcuts that you have no interest in. You find additional preferences at the top of the options page. First, you may add URLs to a blacklist to prevent the extension's keyboard shortcuts from working on those pages. This is mostly useful when these shortcuts cause issues on websites, as it prevents them from happening when you access the sites. You may prevent the auto-focusing of text inputs in the options as well. Keyboard shortcuts won't work if a text input is focused, as characters you type are added to the text field instead. The option is not enabled by default as it changes Firefox's default way of handling text input fields. A third useful option lets you add new previous and next link patterns. The shortcuts "[" and "]" click on previous or next links on pages, and patterns are used to identify those links. The extension searches for "prev", "next" or "more" links on a page automatically, and you may add your own patterns to previous and next fields if sites use different names for those. VimFx is a handy usability extension for Firefox that is like the little brother extension of Vimperator. The list of shortcuts it offers may be overwhelming at first but you won't need all of them. The extension is useful, even if you use only a handful of shortcuts to speed things up. I’ve had this extension installed for a while now It’s so easy to customise and is constantly being improved by the developer. Ultimately I tend to revert to using the mouse (especially because I use mouse gestures with StrokesPlus – it’s one of the greatest mysteries of life to me why everybody who uses a PC is not also using mouse gestures). If I was in a situation that I wasn’t able to use a mouse then I think VimFx would save a lot of time, and the developer deserves a great deal of credit for the time and effort that has been put into the extension.